So in a bit of what the hell news it looks like Microsoft has found it in there heart to give us a chance to play the long awaited Call of Duty: WaW with this hot new demo, oh wait my sources are telling me this game has been out since November of 2008. OK so you damn near have all of your achievements and are just about sick of well over half the maps but you know the new map pack is on the way to make the game like new, thats no reason not to go down load the demo and try your hand at this killer game for no XP and no perks( oh wait yes it is). To be honest here if you don't have this game you probable just don't have any interest in it but hay why not try it out any way. 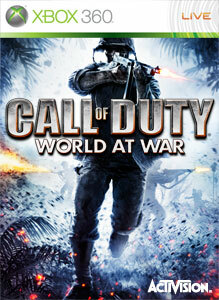 "Call of Duty: World at War Experience the intensity and brutality of war like never before. Unleash the power of the flamethrower, flame tanks, and other lethal weaponry while battling through the most harrowing campaigns in the Pacific and Europe. For the first time ever in Call of Duty, play Co-Op with up to 4 players on Xbox LIVE. In Multiplayer, compete on Xbox LIVE to complete challenges, gain experience, level up, and unlock perks to take out your opponents."